This week is an eventful one in Coney Island. Ringling Bros. troupe of acrobats, daredevils, clowns, tigers, elephants and dachshunds are arriving for a summer-long run. The Coney Island Boom A Ring Circus opens on Thursday, June 18th. The Brooklyn Cyclones season opener and the first Friday Night Fireworks of the season are on Friday, June 19th. Mer people from all over the world are on the way to Coney for the 2009 Mermaid Parade and Ball on Saturday, June 20. See you there! Puppets Jazz Club of Park Slope & JT of Cha Cha’s present Live Jazz on Mondays at Cha Cha’s of Coney Island. Don’t forget your camera! Members of the Coney Island Rumor Mill have been expecting their first sighting of Ringling’s Asian elephants at Tuesday’s celebration. 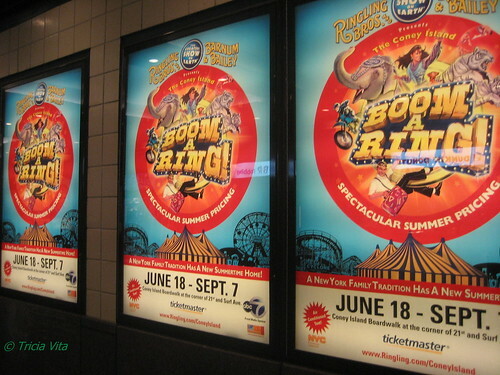 It turns out there is a Ringling Boom A Ring Rumor Mill too! They’re sayin’ the elephants will not be part of tomorrow’s event, but the performers will be there to meet their new neighbors. It will be FUN…. The celebration will include representatives of and performers from The Greatest Show On Earth, the unveiling of “BOOM A RING Blvd.” and “Elephant Crossing” signs, special guest Lynn Kelly, President of the Coney Island Development Corporation (CIDC), and music courtesy of Brooklyn’s own Soul Tigers Marching Band. Performers include Vicenta Pages and her seven white Bengal tigers; the daredevil Urias family with their Motorcycle Globe; the Negrey Troupe of Russian acrobats; “Eccentric Personality” and bicyclist extraordinaire Justin Case; Diana Yedvashkina and her dachshund dog act; and a trio of Asian elephants. The Circus will run on Thursdays through Sundays from June 18th through September 7th. Tickets cost $10-$65. The group’s “Coney Island Cyclone Ride” goes to Coney Island’s Amusement District from Manhattan and is described as a casual bike ride at a relaxed pace. This season’s first ride meets on June 19 at 7:00 pm on the Manhattan side of the Brooklyn Bridge (SW corner of Chambers and Centre St/Park Row) OR 7:25 in Brooklyn at the Carroll St Drawbridge (between Nevins and Bond) OR 7:50 at the 69th St Pier in Brooklyn at the Shore Pkwy bike path entrance (take 68th St). It arrives in time for the fireworks. Upcoming rides are on July 10 and August 21. Staten Island Yankees vs Brooklyn Cyclones at Keyspan Stadium at 7:00 pm. The first Friday Night Fireworks of the season are at 9:30 pm. The Friday Night Fireworks are sponsored by the Brooklyn Cyclones on 7 nights from June to September. Additional dates of Friday Night Fireworks are sponsored by Carol Albert of the Cyclone Roller Coaster and former Astroland; the Vourderis family of Deno’s Wonder Wheel Park, and the Brooklyn Cyclones baseball team. Additional participants in the fireworks include Nathan’s, the Aquarium, the Coney Island Development Corporation, and City Councilman Domenic Recchia’s office. Please show your appreciation for the continuation of this Coney tradition by patronizing the sponsors! Featuring King Neptune Harvey Keitel and Queen Mermaid Daphna, The Uptown String Band from The Philadelphia Mummers Parade, Recording artists They Might Be Giants performing on a float, Monster Truck ‘Blue Thunder’ performing a parade prelude, and performers from Ringling Bros. Barnum & Bailey’s Boom A Ring Circus. 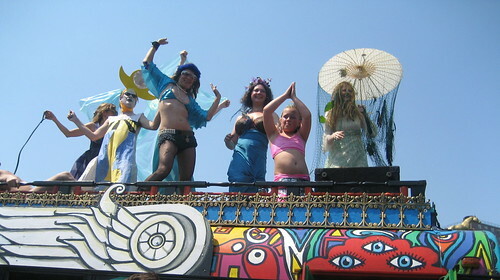 Mermaid Parade, Saturday, June 20th, 2PM! Rain or Shine! The Ball will run in two skating sessions: 5:30pm-8:30pm and 9pm-Midnight. Tickets are $20, skate rental $5. DJ Misbehavior, Burlesque and Sideshow performances. Concession stand will be open, alcohol is prohibited. June 20th 6:30pm Circus benefit for Coney Island USA will get $10 admission to the 9pm skate session. The Coney Island History Project’s free public exhibition center is located on Surf Avenue under the Cyclone roller coaster. This season’s featured exhibition uses archival and contemporary photos, documents, anecdotes, interviews, souvenirs and artifacts to tell the story of Coney Island’s four city landmarks — The Cyclone Roller Coaster, Wonder Wheel, Parachute Jump and Childs Building. The exhibition is curated by historian Charles Denson, the author of the book Coney Island:Lost and Found. The exhibition center is open 1:00- 6:00 pm on Saturdays and Sundays from Memorial Day Weekend through Labor Day. The Miss’ile Roller Dance Crew from France will be teaching a dance workshop at Dreamland on Sundays from 3-4:30 p.m. $20 class price includes free admission to Dreamland Discoteque.